Just about any customer has value. But loyal customers -- those shoppers who will not only buy your premium products again and again, but also talk up your company to all their friends and send you new customers, too -- are priceless. To cultivate added loyal customers, customer service often makes all the difference. 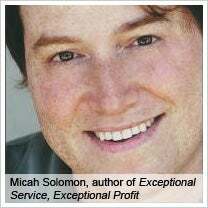 But a company's customer service shouldn't just meet expectations, says customer-service guru Micah Solomon, author of Exceptional Service, Exceptional Profit. It needs to go beyond the norm to deliver exceptional customer service that gets people excited about your brand, which then leads to higher profits, he says. Be quick about it. In this time of email and free Wi-Fi in every coffee shop and iPhones, customers have higher expectations for speedy response than they did even one year ago, Solomon notes. My tip: Twitter is quickly becoming the go-to place for customers with a complaint who want immediate help. I've heard from companies within an hour or two when I posted a problem on Twitter and mentioned their company name. For fast-as-lightning customer service, someone at your business should be scanning this channel and responding to questions and complaints. Be human. Why send a "do-not-reply" email to customers? That's impersonal and off-putting. Instead, Solomon recommends actively inviting email recipients to respond to your messages. Make sure someone at your business is checking frequently and responding to those replies, too. And if you have online chat, have your worker's full name appear, as in "You are now chatting with Jane Chang." My tip: Make sure a live human answers your phone. There's no bigger turnoff than being trapped in voicemail hell trying to leave a message in a company's "general mailbox." Get your lingo down. Great companies develop a set of key phrases to use -- and not use -- in talking to customers. Solomon reports that Ritz-Carlton hotel employees carry pocket-sized cards with reminders of recommended and discouraged phrases to use in common scenarios. My tip: Train your whole staff to be ready to respond to problems. Nothing turns me off like a stammering worker who clearly doesn't know what to say to me when I've got a problem. Make a great first -- and last -- impression. Studies show customers remember the first and last few minutes of a service encounter more vividly -- and longer -- than the rest of the interaction. Work hard on delivering positive messages in those first and last moments to get the most impact from your employee training. My tip: Think of something unique you could do as a first or last contact with customers. The example that springs to mind is from another hotel chain: the Doubletree Hotels. When you check in, they hand you a warm chocolate-chip cookie -- and an exceptionally good cookie, too. Foodies rave about their cookies, which has become a free form of marketing for the chain. When I regularly traveled for business a decade or so back, I always tried to find a way to stay with them. More than 10 years later, I still remember how great it was to get that cookie. How do you use customer service to build customer loyalty? Leave a comment and tell us your approach.